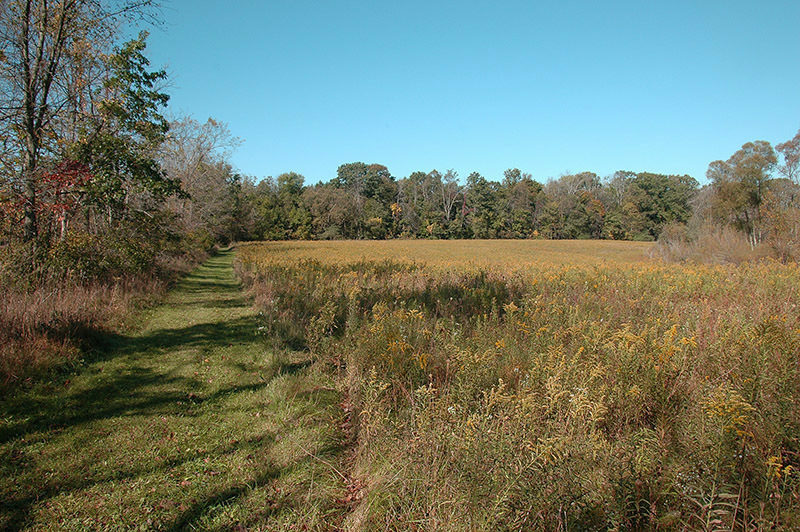 The Leonard Preserve is the largest unit in Washtenaw County's Natural Areas Preservation Program, large enough to include nearly a mile of River Raisin shoreline. Located on the edge of Manchester, Leonard is spread over 259 acres and includes rolling hills, woodlands, wetlands, former pasture land and prairie and oak savanna. This diversity of habitats provides for good wildlife viewing, particularly whitetail deer. 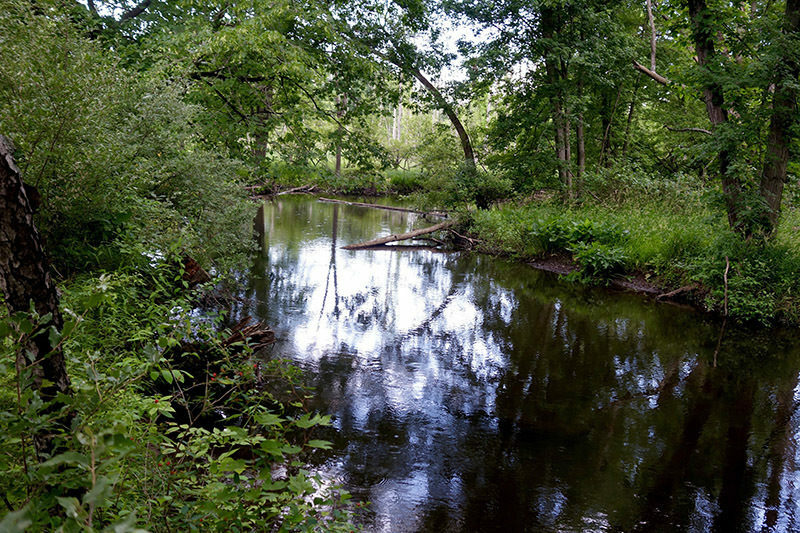 The preserve is easily explored on foot via a 4.2-mile network of trails that begin from a trailhead on North Union Street, northwest of Manchester. Trails are a mix of mowed pathways, wooded foot trails and old farm lanes. The Leonard Preserve is the largest unit in Washtenaw County's Natural Areas Preservation Program, large enough to include nearly a mile of River Raisin shoreline. Located on the edge of Manchester, Leonard is spread over 259 acres and includes rolling hills, woodlands, wetlands, former pasture land and prairie and oak savanna. This diversity of habitats provides for good wildlife viewing, particularly whitetail deer. An aerial survey in 2013 revealed that the preserve had a deer population at 76 deer per square mile. Such an elevated population was causing significant damage to the park’s flora and is the reason a special hunt for disabled veterans is staged on limited dates in a small section of the park. Other species that might be encounter include wood ducks, coyotes, blue racers, and Blanding’s turtles. Leonard was obtained in sections by the Washtenaw County Parks & Recreation and The Nature Conservancy with the initial purchase – a historic farmhouse and the 40 acres surrounding it – made in 2004. The most recent addition was purchased in 2009, a 22-acre slice located across the River Raisin from the original preserve and currently accessible only by canoe or kayak. The rest of the preserve is easily reached on foot via a 4.2-mile network of trails that begin from a trailhead on North Union Street, northwest of Manchester. Trails are a mix of mowed pathways, wooded foot trails and old farm lanes. 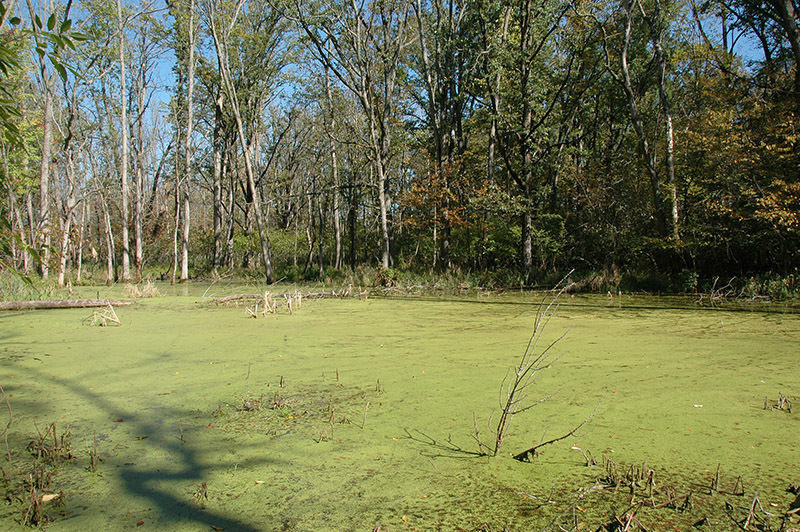 The extensive wetlands, including a floodplain forest, means wet hiking conditions can be encounter anytime from March through November but particularly in early spring. Best time for a hike is in the fall. 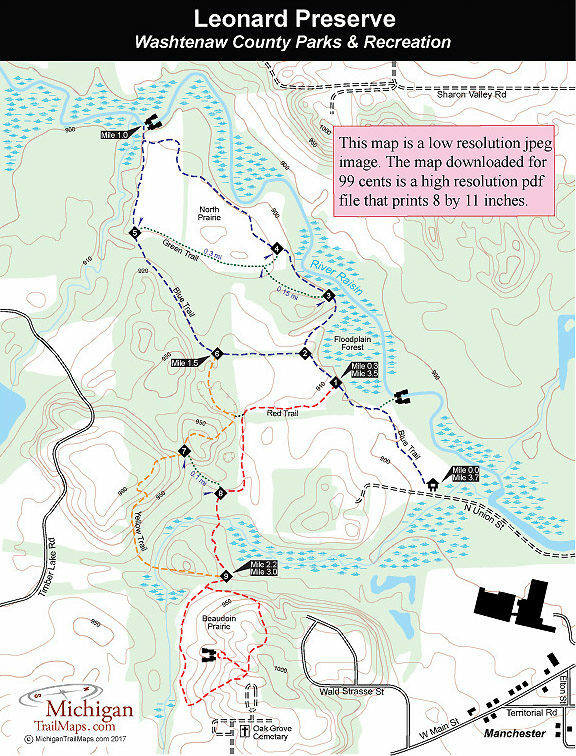 The route described here is the perimeter of the trail system that includes the Blue, Yellow and Red Trails and is a hike that is rated easy and totals 3.7 miles. From the North Union Street trailhead, the Blue Trail is a mowed lane that cuts north across a field and within 250 yards reaches a spur. Head right briefly for your first view of the River Raisin. The river flows 139 miles through six Michigan counties and even a portion of Fulton County in Ohio before emptying in Lake Erie. Here the Raisin appears as a dark, slow meandering waterway. From the spur the Blue Trail remains in open fields, quickly passing a junction with the Red Trail at post No. 1 at Mile 0.3 and then the return of the Blue Trail at post No. 2. Stay right on the Blue Trail to enter the woods and skirt a floodplain forest. After post No. 3 you’ll spot the River Raisin again from a low bluff. At post No. 4, marking a junction with the Green Trail, the Blue Trail enters the open field of the North Prairie. 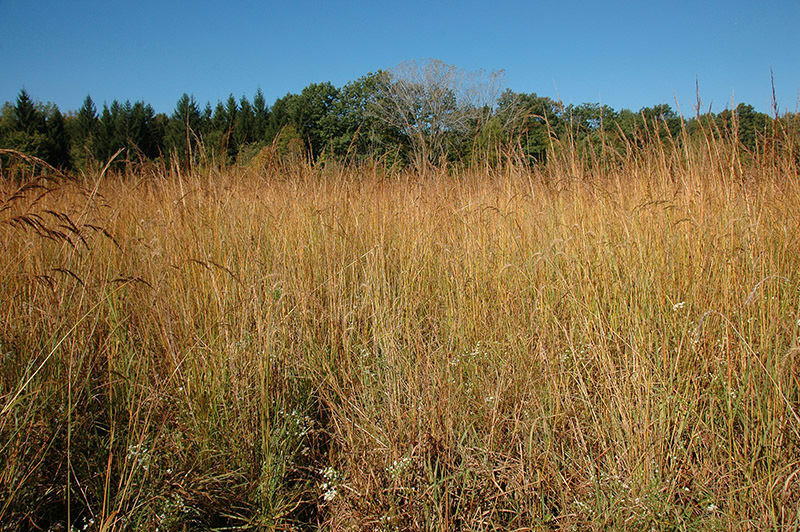 This 10-acre, dry-mesic prairie remnant features grasses that are often more than five feet high by autumn, providing cover for a variety of grassland nesting birds. At Mile 0.9 you arrive at an old farm lane where to the right a short spur leads to your final view of the River Raisin. The main trail heads left, weaving in and out of the forest and passing post No. 5 at the west end of the Green Trail. At Mile 1.5 you reach post No. 6 at the junction with the Yellow Trail. Here the Blue Trail heads east (left) for post No. 2 and can be followed to return to the trailhead and shorten the hike to 2 miles. The Yellow Trail is the right-hand fork that dips in and out of a kettle depression and then climbs a hill. The descent on the back side ends at post No. 7, marking the junction with another Green Trail that can be used as a crossover spur. The Yellow Trail continues its westerly direction to climb another hill before swinging east and merging onto an old farm lane to arrive at post No. 9 at Mile 2.2. To the south the Red Trail forms a 0.8-mile loop through the Beaudoin Prairie, named after the family who sold the 32-acre addition to The Nature Conservancy in 2005. The Beaudoin tract is a unique dry sand prairie covering the western half of a 1000-foot hill to provide excelling viewing point to the west. The Red Trail skirts the base of the hill and then climbs it, passing a spur to a viewing point at the top. You return to post No. 9 at Mile 3 and continue north on the Red Trail, most of it through open fields, before reaching post No. 1 and the Blue Trail at Mile 3.5. Backtrack the first leg of the hike to return to North Union Street parking lot at Mile 3.7. Other then an information board and parking, there are no facilities at the trailhead. There are no fees for visiting Leonard Preserve. From I-94 depart at exit 159 and head south on M-52 for 10.5 miles to Manchester. Turn right onto Main Street from M-52 and then right on North Union Street. Head north and when North Union Street bears left and turns to gravel you will see the preserve entry sign. The parking area and trailhead will be on the right. For more information, contact the Washtenaw County Parks and Recreation Commission (734-971-6337).